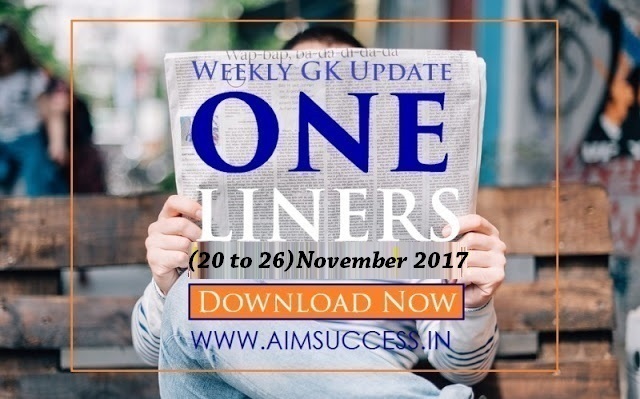 Weekly Current Affairs One Liners (20 to 26 Nov) 2017: Download Now - A recap of the important happenings that occurred between 20 November to 26 November 2017. The important happenings of the week covered in this segment include Miss World 2017, UMANG App and Mahila Shakti Kendra among others. State Bank of India (SBI), the largest commercial bank in India will soon launch country’s first integrated lifestyle and banking digital service platform named YONO (acronym for ‘You Only Need One’). The Sub-Committee of Financial Stability and Development Council (FSDC), headed by Reserve Bank of India (RBI) Governor Urjit Patel, reviewed major global and domestic developments that could impinge country’s financial stability. Andhra Bank has launched a new scheme, Pattabhi Sitaramayya — Self Business Group (PS-SBG) for self-help groups (SHGs) to encourage entrepreneurship. 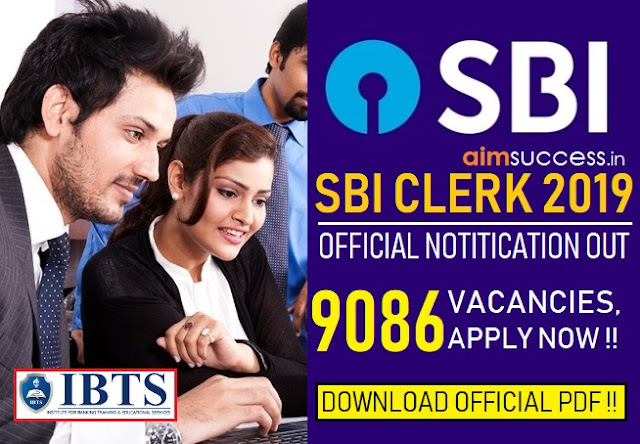 Private sector RBL Bank has set up an all women branch in Chennai. PM Narendra Modi inaugurated the fifth edition of Global Conference on Cyber Space (GCCS) in New Delhi with the theme “Cyber4All: A Secure and Inclusive Cyberspace for Sustainable Development”. The 12th meeting of Standing Committee of Inter-State Council, chaired by Union Home Minister Rajnath Singh, was held in New Delhi. Standard & Poor Global Ratings retained its BBB rating for India’s sovereign with a ‘stable’ outlook. The Indian Tsunami Early Warning Centre (ITEWC) based at Indian National Centre for Ocean Information Services (INCOIS) had conducted “Multi-State Mega Mock Exercise of Tsunami for East Coast ofIndia”. Prime Minister Narendra Modi formally launched UMANG (Unified Mobile Application for New-age Governance), a state and central government services app. India is going to host the 36th International Geological Congress (IGC) in 2020 in NCR New Delhi. Minister Narendra Modi’s vision to create a “New India” over the next five years. The Union Ministry of Housing & Urban Affairs has announced that 30.76 lakh houses for the urban poor have been sanctioned so far since the launch of Pradhan Mantri Awas Yojana (Urban) Scheme in June 2015. The drug price regulator National Pharmaceutical Pricing Authority (NPPA) has capped prices of 51 essential medicines, including those used for treatment of cancer, heart conditions, pain and skin problems. India ranked 51st among 63 countries on the IMD Talent Rankings in terms of ability to attract, develop and retain talent. Switzerland topped the list followed by Denmark and Belgium. A comprehensive ‘safe city’ plan for women will soon be kicked off in eight cities, Delhi, Mumbai, Kolkata, Chennai, Ahmedabad, Bengaluru, Lucknow and Hyderabad, where a robust emergency response system and police-verified public transport will come into place. India has asked the United Nations to declare 2018 as the 'International Year of Millets' to promote it as nutrition-rich smart food across the world. India becomes Second Largest Fish Producing Country in the World. The Union Ministry of Health and Family Welfare observed the Vasectomy Fortnight (Nov 21-04 Dec) with the theme “Zimmedar Purush ki yehi hai Pehchan, Parivar Niyojan mein jo de Yogdaan” to raise awareness about male sterilisation and to promote the participation of men in family planning. The Union Finance Ministry has granted Infrastructure Status to the Logistics sector. Logistics Infrastructure was included by insertion of new item in renamed category of ‘Transport and Logistics’. President Ram Nath Kovind inaugurates International Gita Mahotsav in Haryana. Lakhs of migratory birds have made their way to Chilika Lake (Odisha) after a long flight of thousands of miles. The first ever North East Development Summit (NEDS) 2017 inaugurated by President of India Ram Nath Kovind in Imphal, Manipur to boost trade and investment in underdeveloped region of North East. The annual Sangai Festival celebrated in the northeastern state of Manipur to promote Manipur as a world class tourism destination. World’s biggest toilet pot model was unveiled at Marora, popularly known as the ‘Trump village’, in Haryana on the World Toilet Day (Nov 19) in a bid to create awareness towards sanitation and use of toilets. The 42nd World Congress of the International Committee of Military Medicine (ICMM), organised by the Armed Forces Medical Services (AFMS) under the aegis of the Ministry of Defence (MoD), held in New Delhi. The Women's Youth World Boxing Championship begins in Guwahati, Assam. Samsung India, a subsidiary of the South Korea-based electronics major, has partnered with the Uttar Pradesh govt to set-up 20 new smart healthcare centres across the state to provide healthcare equipments. IKEA, the Swedish furnishing retailer, opened its first experiential centre Ikea Hej (Hello) Home close to the IT hub of Hyderabad. American singer Beyonce has been named the highest-paid woman in music in 2017 by the Forbes. The UNFCCC Climate Change Conference (COP23) concluded with countries putting in place a roadmap for ‘Talanoa Dialogue’ in Bonn, Germany and was presided over by Govt of Fiji. Andaman & Nicobar Command from 20 to 24 November 2017. India successfully flight-tested the air variant of BrahMos supersonic cruise missile from a Sukhoi SU-30MKI fighter jet to hit a sea-based target in the Bay of Bengal, completing the country's tactical cruise missile triad. The first India-Myanmar Bilateral Military Exercise 2017 (IMBAX 2017) was held at Joint Warfare Centre at the Umroi Joint Training Node in Meghalaya. Scientists from Botanical Survey of India (BSI) have discovered a new species of parasitic flowering plant named Gleadovia konyakianorum, in honour of the Konyak tribe of Nagas. The Cabinet Committee on Economic Affairs (CCEA) approved "Pradhan Mantri Mahila Shakti Kendra" scheme for a period 2017-18 to 2019-20. The Union Cabinet under the chairmanship of PM Narendra Modi has approved setting up of 15th Finance Commission (FC) under the chairmanship of NK Singh and the recommendations' will cover five years commencing on April 1, 2020. The Union Cabinet has approved continuation of scheme on Indian Institute of Corporate Affairs (IICA) for another three financial years (FYs 2017-18 to 2019-20). The Union Cabinet has approved revision in salaries, gratuity, allowances, pension etc. of Judges of Supreme Court and High Courts and retired Judges of Supreme Court and High Courts. The Union Cabinet approved signing an Agreement on Cooperation between India and Russia in field of combating all forms of terrorism and organized crime. The Union Cabinet has approved India’s Membership for European Bank for Reconstruction & Development (EBRD). The Union Finance Ministry has constituted task force, headed by Arbind Modi, Member (legislation), CBDT, which will focus on reviewing Income Tax (IT) Act 1961 and draft new direct tax law in consonance with current economic needs. Paytm has bought an undisclosed stake in Urja Money Private Limited which evaluates the creditworthiness of people seeking loans to buy two-wheelers. Govt has signed four MoUs under Ujwal DISCOM Assurance Yojana (UDAY) Scheme with Nagaland and UTs of Andaman & Nicobar Islands, Dadra & Nagar Haveli & Daman & Diu for operational improvements. The Union Govt has signed a guarantee agreement for IBRD/CTF loan of US $98 million and Grant Agreement for US $2 million for Shared Infrastructure for Solar Parks Project with World Bank. Nabaneeta Dev Sen has been declared winner of the Big Little Book Award this year in the "Author in Bengali Language" category for her contribution to the children's literature. Veteran journalist Manik Banerjee, who is also an acclaimed mountaineer, was presented with the 'Life Time Achievement Award' by the Indian Mountaineering Foundation (IMF). India’s Ritu Phogat has won Silver medal in 48 kg category in Under-23 Senior World Wrestling held in Poland. Lionel Messi won the European Golden Shoe award for the fourth time. Afghanistan thrashed Pakistan by 185 runs to clinch their maiden Under-19 Asia Cup title at the Kinrara Academy Oval in Kuala Lumpur. Current woman world athlete of the year Almaz Ayana of Ethiopia clinched gold in her debut race while compatriot Berhanu Legese won the men's event in the Delhi Half Marathon, 2017.